Aspiring actress and adoring fan Eve Harrington (Anne Baxter) has thrust herself into the life of an aging, fading star of a stage actress named Margo Channing (Bette Davis), who takes pity on her, bringing the charming Eve into her close circle of friends and actors. The fantastic "All About Eve," directed by Joseph L. Mankiewicz, was nominated for an astounding 14 Academy Awards in 1950. This is a story about actors, and as we know all too well, actors love films about actors, and this one has the added advantage of being all about the cutthroat nature of show business, too. "All About Eve" is one of the two most nominated films in the history of the Academy Awards, the other being "Titanic," which also received 14 nominations 47 years later. This film took home six out of 14 Oscar trophies, including the top prize, Best Picture, as well as Best Director and Best Screenplay, among others. Bette Davis was arguably one of the most talented actresses of her generation. Here, Davis plays Margo Channing, who is full of herself, arrogant, and looks down on those she feels is beneath her. She might be a fine actress, but she is getting older, which means she is getting fewer parts. Margo is a total diva behind the scenes, but can also be frank and brutally honest, never shying away from how she really feels. Anne Baxter plays Eve Herrington, who takes a different approach to the business. She seems sweet and amiable as a kid who has seen every single one of Margo's performances for the play she currently is performing in. Upon getting to meet her idol, Eve is immediately thrust into Margo's circle of friends as they all take pity on her sob story. Though innocent on the outside, actually, she is conniving and ruthless. Eve is willing to step on anyone to get what she wants, using her charm to make others lay down for to make it easier for her to step on them. From the moment the stage is set, there are lies and deceit everywhere with constant back biting between characters. These are people who will say one thing out loud, but turn around a cut those same people down while their backs are turned. Anne, Margo, and their circle of friends are often very nasty people, but it is presented in such a way that "All About Eve" is both smart AND funny, not just bitter and conniving. There are tons of genuine laugh out loud moments, and other moments where your eyes will widen as Bette Davis is given the opportunity to do her thing, which is drain the air from a room as she spills her secrets, in the most spectacular fashion. The acting is amazing from both Anne Baxter and Bette Davis. They are both so great in this film, but then again, when was Bette Davis not a fabulous actress? As good as they are, it's really hard to root for either one of their characters as they are both hugely flawed as people. Both Baxter and Davis were nominated for their performances in the leading actress category. It's not just these two that are marvelous. In fact, across the board, the acting is great both Celeste Holm, who plays Margo's friend Karen Richards, and Thelma Ritter, who plays Margo's maid Birdie. Both of these women also received nominations in the supporting actress category for their performances. However, in an interesting turn of events in a movie almost wholly saturated with main female performances, the only person from the movie to take home an Oscar for their acting was George Sanders, who plays theater critic Addison DeWitt. 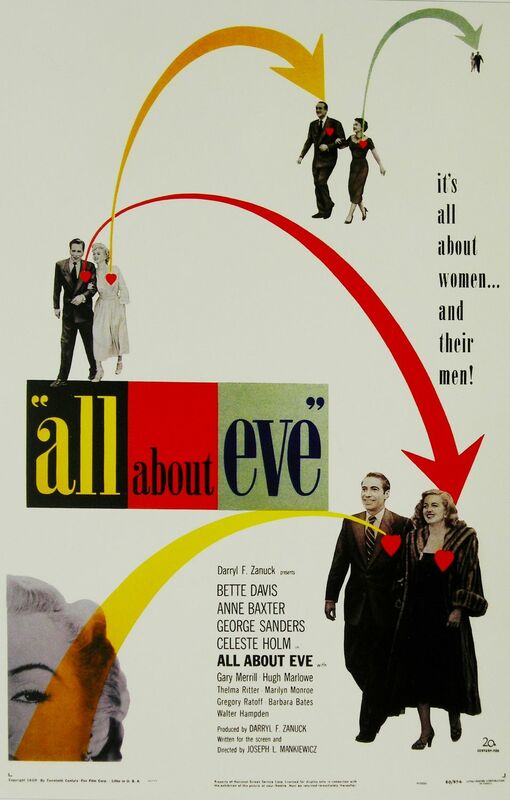 If you love classic old movies about the stage and theater, "All About Eve" is your golden ticket. Fans and critics adore this movie for its wit, its cunning subject, and because it has held up over the years. It's hard to divulge much more about the story, even 66 years later because you have to watch it for yourself, it's that good. Take a chance on this one. One year ago, we were watching: "Ordinary People"